hello job interview Steve has decided he's fed up with the transport industry. But as we kind of need his income, and the bulk of his experience is in the transport industry, we're sort of limited with the jobs he can apply for. But sometimes something randomly drops into your lap that makes you think "I could totally do that" and he's got an interview this afternoon. It's still transport related, but not solely in the transport industry, so who knows how it will pan out. Fingers crossed. hello home grown vegetables We've been down the path of backyard garden beds before, ending up with very well-fed grasshoppers. 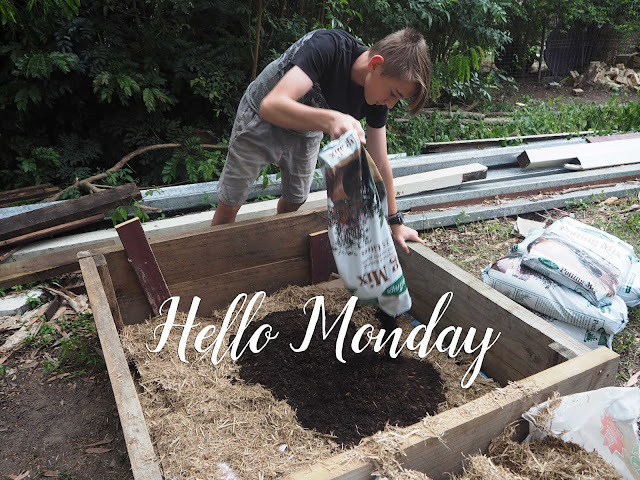 But Douglas is determined to transfer his pumpkin plants into a garden bed, so we've tasked him with the job of figuring out how to keep the plants safe. And we've got carrots, lettuce, wombok, cucumbers and peas to have a go at, too. hello bees We've lived in this house for almost ten years now, but it was only last week that I realised that the constant buzz of bees is from the jacaranda tree, not the other trees in the backyard. And they don't just hang around the flowers on the tree, but the blossoms on the ground, table, trampoline, chairs. This significantly reduces my ability to use the backyard without going to extremes to remove the blossoms from the immediate vicinity. So I've temporarily given up on backyard time, in favour of breathing. hello early mornings Now, I'm generally a bit of an early riser, preferring mornings over late nights (unless I get sucked in by a good book), but we're currently crate training Daisy so we can take her camping with us, which means earlier-than-usual mornings. Not that I mind too much, but it can sometimes make for a long day, especially on lazy, rainy Sundays. hello gingerbread I don't remember ever having successfully made gingerbread in all my years of baking. Sure, I've made some pretty great ginger-based items (white choc ginger slice, ginger crackles, soft ginger cookies) but the actual cut-out-and-decorate type cookie has been missing. I've looked at lots recipes, and this week I need to actually start baking them to see which one is the winner. There's only 62 sleeps to Christmas. All the best to Steve with his interview and I hope you can reclaim your backyard soon - seems highly unfair you need to cede your right to the space to the bees! Gingerbread - yummm.... it's not something I've ever tried to make but I recall making it as a kid with my mother. I thought I'd make gingerbread houses with the boys this year. I can't wait.